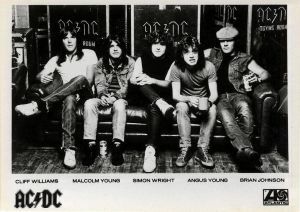 I guess one of the cooler in-person interviews I’ve ever done was that time back in October of ’83 when I hung out with three members of AC/DC–singer Brian Johnson, rhythm-guitarist Malcolm Young, and then-new drummer Simon Wright–at the Four Seasons Hotel in Vancouver. The Aussie earbusters were in town to launch their Flick of the Switch Tour, which started October 11 at the Pacific Coliseum and ended on December 19 at New York’s Madison Square Garden. They were sitting around on the hotel-room floor smokin’ ciggies and drinking tea. There was no Jack Daniels to be found. Just as well, because I had a bad cold at the time. That’s me coughing. I remember bumming a smoke off one of the guys, which didn’t help the coughing anyway. Posted in Fav Reblog Posts, Music, R&R History for 200 Mr Trebek.